Yesterday we had our Spring bank holiday here. Nothing better to do but to go to a carboot sale. Oh, how I love these, all the kitsch and all the bargains… and even though it was really small, it wasn’t disappointing. 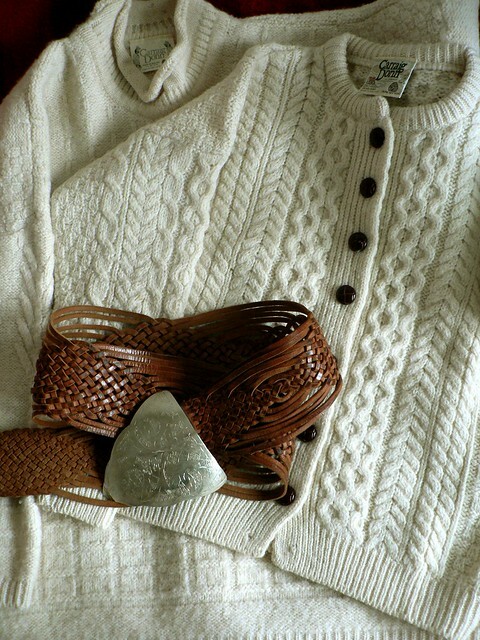 Two thick 100% wool Irish jumpers for £5, plus the lady threw in the belt as I was admiring the leather craft braiding and the Celtic style buckle. 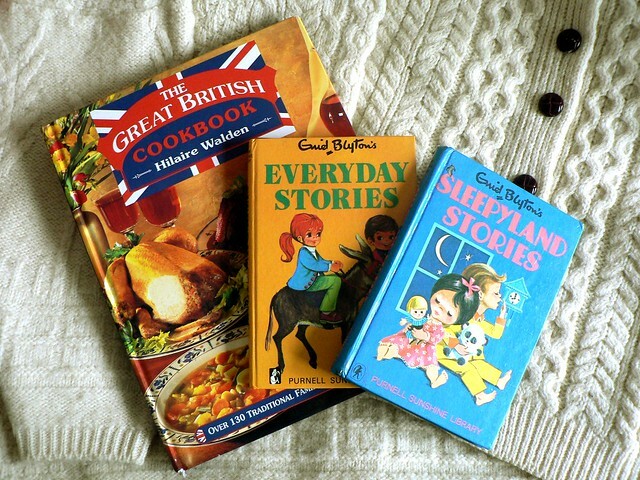 The Great British Cookbook, Enid Blyton’s Everyday Stories and Sleepyland Stories, 50p each. The best finds of the day: Charles and Di biscuit box and mug from their wedding in 1981 and a mug from the Queen’s jubilee in 2002. All for £1 each. 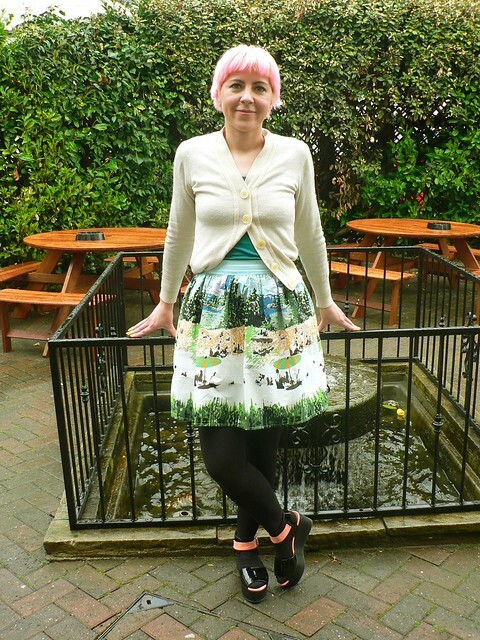 I love your skirt, so pretty print and swirl! And you look fabulously pinkhaired! You look like a breath of fresh (h)air! Love it!! Great finds, too. One of these days, I'm crossing the water so I can say “jumper” instead of sweater. Cute jumpers, how nice of the seller to give you the belt for free. I find that going to a smaller boot sale you find more treasures. Monday i went to a further bigger boot sale and all i found was lip balms. 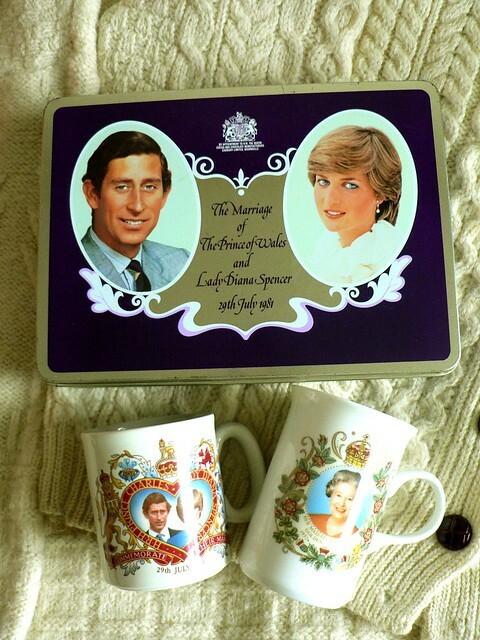 I also would of snatced up Charles and DIana bisquit box to use for the jubilee. What an awesome beach scene skirt. Hanging out with friends is the best thing ever.